Let’s talk protein . . . The World Bank-sponsored CGIAR (Consultative Group on International Agricultural Research) institutes have done a wonderful job over the last 50 years when it comes to improving the productivity of all the key starch crops: rice, wheat, corn, potatoes, and cassava. Projecting forward to a global population that is expected to exceed 10 billion before stabilizing, there should be no problem whatsoever satisfying the world’s demand for starch – even with a predictable explosion of the middle class as a percentage of that total. Where the CGIAR institutes, as a group, have failed, however, is keeping pace with that exploding middle class when it comes to demand for protein crops. 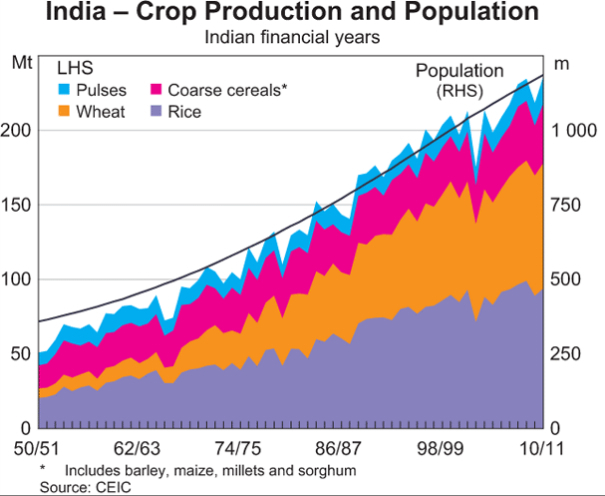 This problem is well illustrated in the following graph depicting Indian crop production and population growth over the last 60 years. While starch crop production has more than quadrupled during this period, production of protein crops has increased by a factor of less than 2. Today, demand for meat and “higher protein content” in vegetarian foods by the growing Indian middle classes, is driving a massive increases in demand for high protein feedstuff that is being only partially met through growing imports of soybeans. The “protein deficit” in South Asia and Africa is expected to continue increasing for the next 50 years. There has been some good news. 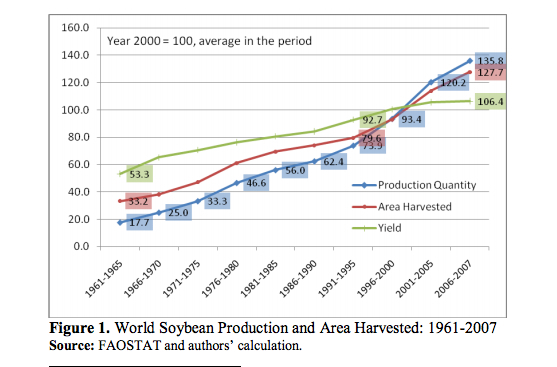 The world average soybean yield doubled from 1.16 metric tons per ha in 1961-65 to 2.31 metric tons per ha in 2005-07. Of the top 5 soybean production countries, Argentina has reached 2.74 metric tonnes per ha while India, unfortunately, still only produces about one metric tonne per hectare. The quadrupling of the area harvested and a doubling of the yield since 1961 has increased world soybean production 7.6-times. During that same period, the main production area has shifted from the USA and Asia (China and India) to the USA and South America, notably Brazil and Argentina. This increase in soybeans has not, however, seen a commensurate increase in production of other vegetarian protein sources suitable for direct human consumption – beans, lentils, and “peas.” Continuing increases in the production of alfalfa (lucerne), which has relatively high leaf-protein content, is helping to bridge the protein gap in livestock feeds. The “gap” continues, nevertheless to widen. Globally, during the last several years we have also seen a severe decline in fishmeal production due to overfishing of anchovies off the coast of Chile and Peru. This is coincident with an unfortunate flattening of the productivity growth curve for soybeans. Despite massive price increases, the surging demand for high protein feedstuff is, therefore, being met largely by increasing acreage of soybean production through the clear cutting of Amazon forest lands. This is a tragedy in the making. It has serious implications for global warming. Algae and duckweeds, can both increase production of protein on a given “flooded” footprint by a factor of 30 to 40 over what soybeans can produce. Both also produce a higher quality protein. The critical amino acids, lysine and methionine, are not, as with soy protein, notably deficient. 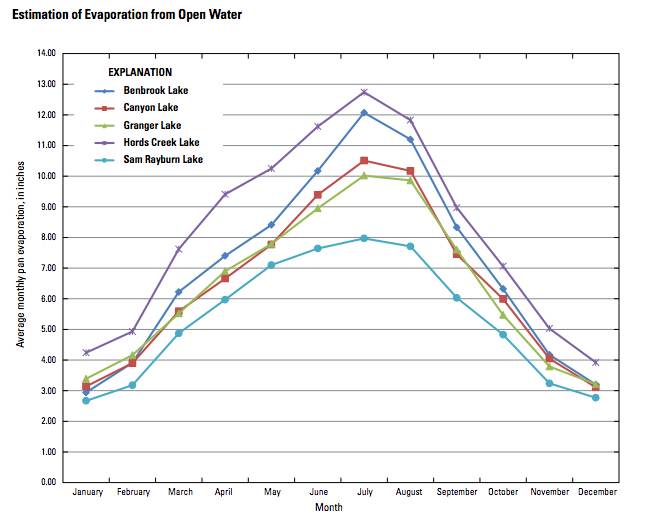 One can argue “production efficiencies” with proponents of algae or duckweeds, but recent evidence suggests that “harvested output” of both under open-air conditions is comparable (“done right,” between 60 and 80 tonnes dryweight per hectare per year) – with the cost of producing duckweeds notably lower (lower capital costs and lower recurrent costs). Score two for duckweed. We then come to the issue of “water.” There is simply not enough of it to go around. Cities are begging for it. Power plants are not being built for lack of it – despite desperate shortages of electricity. Farmers of “water indulgent” crops like rice and sugarcane are being forced to cut back their acreage in many regions. Algae production uses water at the same rate as “pan evaporation” – which is massive. Pan evaporation in South Texas, for instance, can reach 12 inches (1 acre foot per acre) in a single mid-summer month — falling to about 20% of that in mid-winter. Duckweeds, which have limited transpiration due to the plants’ “waxy” exterior, completely covers the water surface. This serves to limit evaporation to about 50% of open pan evaporation on the same footprint. Duckweed water “use” can therefore reliably be calculated to be about 50% of that required by algae. While this lowers costs (around $500 per acre per year with water pegged at $60 per acre foot), the greater significance is simply using much less of a desperately constrained resource. Score three for duckweed. By growing valuable duckweed, a wastewater treatment plant can now also become a genuine profit center – as opposed to being considered a massive “cost liability” by the responsible municipal government. Duckweed’s massive efficiency at removing nutrients from water now allows cost-efficient treatment of that water to a completely potable condition – allowing that water to be recycled back through the town or city’s water supply system, and thus potentially cutting the town or city’s water supply requirements by as much as 70%. Now, we suddenly have more water to go around. Yes, we can afford to construct that new power plant. Yes, the city can continue to grow and thrive. Game, set and match to duckweed! Now, back to our discussion on protein. Assuming that the best circumstance for growing duckweeds is treating municipal wastewater, let’s look at the consequences of doing so. Let’s pick a city at random – a city in India, the “big” country which is projected to suffer a greater “protein squeeze” than any other. How about Visakhapatnam, a costal city of 2 million that is suffering severe water constraints – as are most cities of its size – and yet throws away all of its partially treated (largely untreated) wastewater – a flow of around 4 cubic meters per second. A comprehensive Agriquatics system capable of treating, to a fully recyclable potable condition, all of Visakhapatnam’s wastewater, would occupy between 1000 and 1500 hectares of land (on a joint venture-basis with farmers – sic: “no capital cost for the land”) around the perimeter of the city. It would be financed on a “commercial basis,” with system productivity and “profitability” covering both capital and recurrent costs. It would be infinitely “flexible,” – moving continuously beyond the urban perimeter as the city grew (5-year amortization of production circumstances allows this – with high capital gains on Agriquatics land “given up” to subsequent development). From a protein perspective, it would be expected to produce “around” 60,000 tonnes, dryweight, of duckweed each year. This is equivalent to the same amount of soymeal as is now produced on 60,000 hectares of land in India today. It will replace imports of an equivalent amount of soymeal and save India around $35 million in foreign exchange losses per year. The Agriquatics System would also allow approximately 3 cubic meters of water each second to be recycled back into the Visakhapatnam water supply – giving the city a completely new lease on life. Ultimately, the direct and indirect value of that massive injection of water would measure in the tens of billions of dollars per year to the city, its businesses and its citizens. We have our paradigm shift. If the effluent was just biological and wasn’t contaminated, the duckweed could also be used as animal feed as another part of the closed loop. It’s a great idea, but it’s going to be an uphill battle all the way. Why? Because it makes too much sense. Perhaps I am in error, but duckweed alone would seem to be a slow way to cleanse water by itself, and it seems to mainly clean up phosphates and nitrogen, particularly ammonia. If cattails and water hyacinth were used as the initial cleansers of water, duckweed could do the final cleansing. Cattails can absorb solids, eat organic bacteria and detoxify dissolved chemicals like mercury. Water hyacinth has the capacity to absorb heavy metals and organic compounds. A sewage marsh-stream, with Cattails and water hyacinth upstream, and duckweed downstream. Like duckweed, cattails and water hyacinth both grow and multiply at an incredible rate, esp with organic materials in the water. Both can be harvested to produce ethanol. While the nutrient-hog called corn only produces 75-200 gallons of ethanol per acre, cattails are the runaway best producer at anywhere from 1000 to 2500 gallons (or more) per acre, using sewage effluent as the fertilizer. With some changes, farm machinery can be adapted to run on almost straight ethanol, allowing farmers to produce their own fuel. Ethanol comes from the sugars and starches in the plant (from the sun), the “waste” leftover is fertilizer for the soil. Farmers/ethanol producers can use the ethanol to run the distillery rather than petroleum. IOW, a closed loop to the benefit of the farmers. For once. Clean water, fuel, natural fertilizer. How does it get better than that? Hi Sue, I like marsh systems as well. The main reason I push duckweed is that it’s the easiest to harvest on a continual basis (year round if you like) and does work similarly to water hyacinths and cattails, but is much easier to harvest and process. Plus, as you mentioned, it has the added bonus of being used for animal feedstock, etc… Retention time of duckweed on heavy metals is very close to water hyacinths, actually. I did some research on cattails for biofuel few months ago. Had an enjoyable phone visit with one of the world’s leading experts on cattail production, Peggy Korth. She has been a lone champion for cattails until fairly recently. As it turns out, cattails need the cooler fall months to convert sugars in the plants to starch in the roots. If left alone for several years, that root complex can be 8-12 ft deep of nearly solid roots. That’s a lot of starch! Bottom line, very few aquatic species have been exploited to their full potential towards our goal of a sustainable lifestyle. The ILA recognizes duckweed primarily, but all aquatic vegetation is our second mantra. So, Sue, keep on championing your multi-faceted system. It’s all good. Great article tamra. Adding global warming, the decrease of arable lands (85% already occupied) growing demand for real estate and the competition between humans and animals on protein crops, duckweed became a Must-have and not nice-to-have anymore.